This guide is a collection of non-combat equipment from the various rulebooks and supplements released in the last few years. Great for players or GMs wanting a quick reference guide. 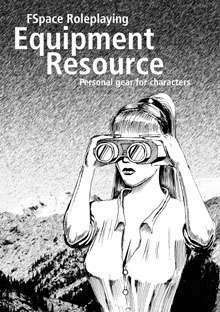 The FSpaceRPG Equipment Resource is a 58 page A5 resource book full of personal equipment for use by characters. Ideal for players or for Game Masters with older or smaller rulebook sets. Now with additional copy better suited for use on mobile devices. Check out our full range of products available here!